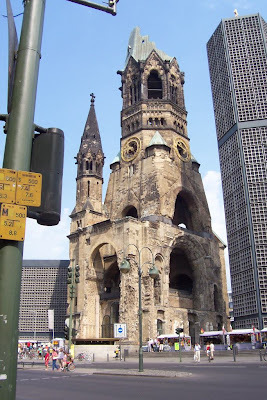 An everyday tourist might find odd that I missed a number of Berlin's notable sights in summer of 2007. With only 5 days to spend in a European heatwave, Berlin is a mighty grand city to cover. Grand could be the size of the city, the cornucopia of attractions, museums, palaces, memorials or the combination of both, plus anything else thrown in to amuse just about anybody. I missed the Unesco World Heritage sites, Museum Island comprised of 4 or 5 museums on the east side, Sanssouci Palace in Potsdam both of which could have taken a full day to appreciate. Or, the more esoteric Bauhaus Archive (museum for architecture and design) in Tiergarten, and the 1936 Olympic Stadium immortalized in Leni Riefenstahl's film, Olympia. However, what I didn't miss were just as interesting and notable. 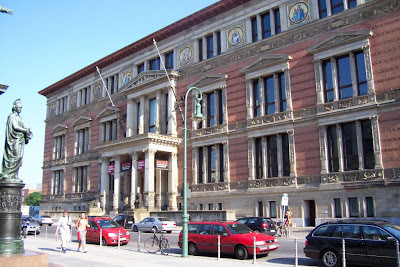 Martin-Gropius-Bau in the first photo, is a museum of modern art. I found the museum accidentally just a short walk from Checkpoint Charlie. Gropius is the founder of Bauhaus design group but the museum's past intrigued me more than what's in it. 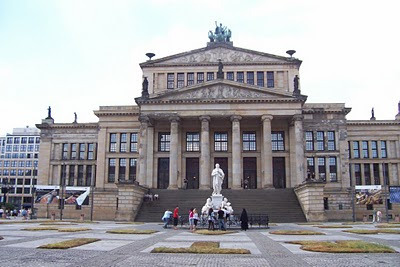 The Italian renaissance building was once the headquarter of the Gestapo. The square with the iconic church reminds me of Times Square in NYC but a lot safer, a tad more genteel. It is a meeting point of tourists, strollers, hawkers and bystanders watching the world go by. After staying a couple of days in the staid and lackluster east side, I moved to a hotel on Ku'dam next door to a Moevenpick restaurant. Nothing like a Marché for comestibles. The Konzerthaus on Gendarmenmarkt is flanked by the Deutscher Dom (German Cathedral) and the French Cathedral forming a humongous square. Judging from the cafes and the shops in its periphery, I gathered it was a chi chi place to be. Sitting under umbrella in a lounging chair in a cafe next to the museum was as upscale as I could get. 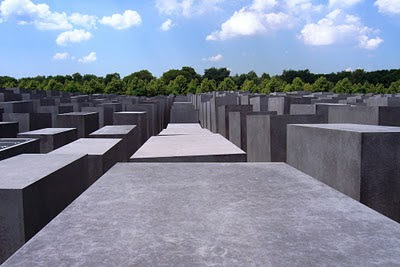 Not too far from the Brandenburg Gate is the Holocaust Memorial, 19,000 square metres of "stelae", rectangular blocks of black stone of various sizes. The memorial has been controversial since it opened in 2005, but I found it moving and awesome. You be the judge. Finally, the golden statue of Victory sits on a large rotunda, facing the Brandenburg Gate on Unter den Linden. 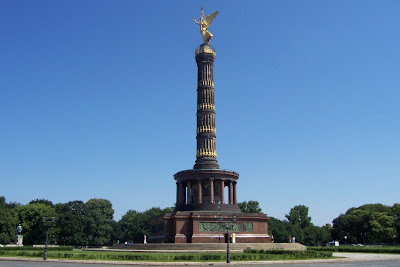 The 2 memorials are Prussia's major contributions to Berlin. On top of the tower, one can see the Tiergarten surrounding the tower. Tiergarten just like Central Park in NYC is a massive greenery in the summer. But beware of naked bodies in the woods, since Berliners believe in clothing optional parks. Not too bad. Except for that free Bach Choir concert I missed.